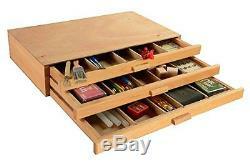 Displays2go ARTSNH8B 3-Drawer Wood Art Box for Paints, Charcoal and Drawing Tools, Beech Wood, Set of 5. This is a brand new: Displays2go ARTSNH8B 3-Drawer Wood Art Box for Paints, Charcoal and Drawing Tools, Beech Wood, Set of 5 This wood art box has 3 drawers for storing an assortment of art supplies. Each drawer has 5 compartments to keep tools organized. The 3-drawer wood pastel box is constructed from beech wood, which is both durable and lightweight. The art box is ideally meant for storing pastels, charcoal, brushes, pens, erasers, blending tools and other smaller supplies. Dimensions: Overall: 15.75"w x 3.25"h x 9.75d Weight: 6 lbs. 3 drawers keep art supplies organized - Great for storing pastels, charcoal, pens, erasers, blending tools and much more - Each drawer has 5 compartments to organize supplies - Solid beech wood construction for daily use - Displays2go SKU No. Is only relevant for this item: Displays2go ARTSNH8B 3-Drawer Wood Art Box for Paints, Charcoal and Drawing Tools, Beech Wood, Set of 5. We do not accept P. BOXES -PLEASE PROVIDE A PHYSICAL ADDRESS. We advise you to use a reputable carrier service when returning your goods. We guarantee that your issue will be solved quickly. We usually respond within 24 hours on weekdays. Feel free to browse our store categories to find more interesting products.. The item "Displays2go ARTSNH8B 3-Drawer Wood Art Box for Paints, Charcoal and Drawing Set" is in sale since Friday, July 08, 2016. This item is in the category "Crafts\Art Supplies\Drawing\Other Drawing Supplies". The seller is "lotoonsca2" and is located in US. This item can be shipped to United States, to Canada, to United Kingdom, to China, to Mexico, to Germany, to Japan, BR, to France, to Australia, RU, DK, RO, SK, BG, CZ, FI, HU, LV, LT, MT, EE, GR, PT, CY, SI, SE, KR, ID, to Taiwan, ZA, TH, to Belgium, to Hong Kong, to Ireland, to Netherlands, PL, to Spain, to Italy, to Austria, IL, to New Zealand, PH, SG, to Switzerland, NO, SA, UA, AE, QA, KW, BH, HR, MY, CL, CO, CR, PA, TT, GT, HN, JM.